ARE YOU A NEUROSCIENTIST? ARE YOU AN APP-MAKER? | RUN! RUN! RUN! Are you a neuroscientist? Are you an app-maker? Call RUN! RUN! RUN! now, to create the prototype JEREMY BENTHAM VS. LAZY PHILOSOPHERS APP. Working with neuroscientists, app-makers and the brilliant scholars of the award-winning Bentham Project, RUN! RUN! RUN! 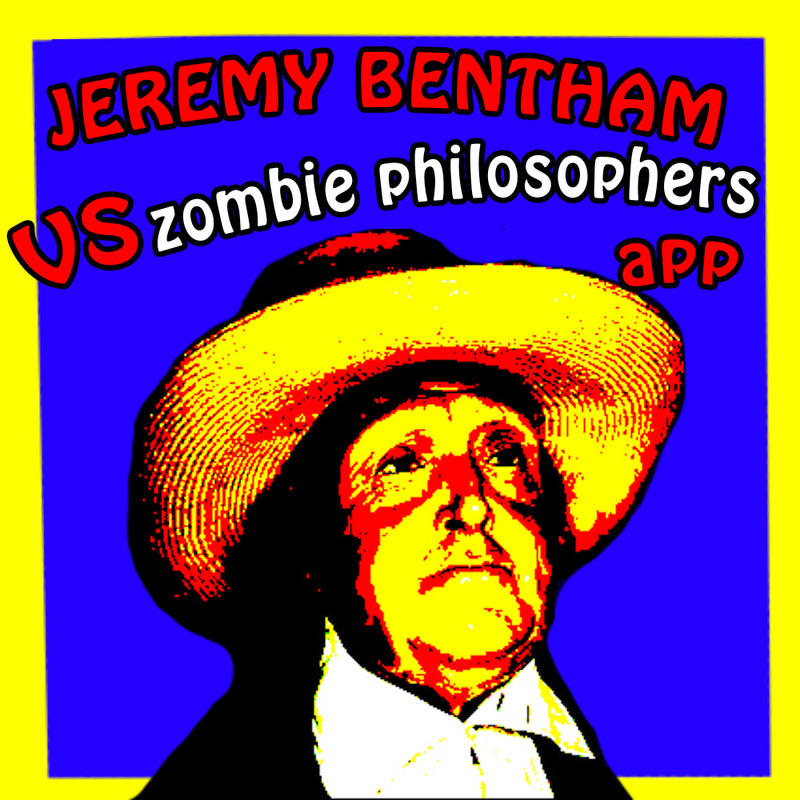 proposes the development of an app called The Jeremy Bentham Vs. Lazy Philosophers App. It is a first-person game as much as it is a tool for an individual to monitor the health of their mind and body, and a means to delve into the dark, hitherto unseen world of philosophical death matches – in the form of a running race. This work was first conceptualised in Summer 2013. Level I: Healthy Body Healthy Mind. Users of the app assume the identity of the great philosopher Jeremy Bentham. Part I is called Healthy Body Healthy Mind. Before dinner each day, users of the app jog for 45 minutes around St James’ Park in Central London (use of other parks elsewhere are permissible). All things being equal, over a period of time, the app should report that the user’s level of fitness of their body and mind have improved. Users who fail to show improvement cannot progress to Level II of the app. Level II: The Great Philosophers' Run Off. If (and only if) user has improved their health significantly (e.g. blood pressure level less than half of what it was; amount of time taken to solve complex mathematical equation less than half of the time they needed), they qualify to play this game. In this game, user enter The Great Philosophers’ Run Off. This competition is a little similar to the Great British Bake Off (in spirit, not calories). Assuming the identity of Bentham, user runs in a race facing virtual competitors consisting of philosophers Slavoj Zizek, Jean Baudrillard and Alain Finkielkraut. The race consists, once again, of running around St James’ Park for 45 minutes before dinner. If user wins, they will be awarded Pleasure. The app emits pleasure-causing vibrations onto the user. If they lose, they are awarded Pain. The app emits pain-causing shocks to the user. User can repeat Levels I and II for indefinite period of time. 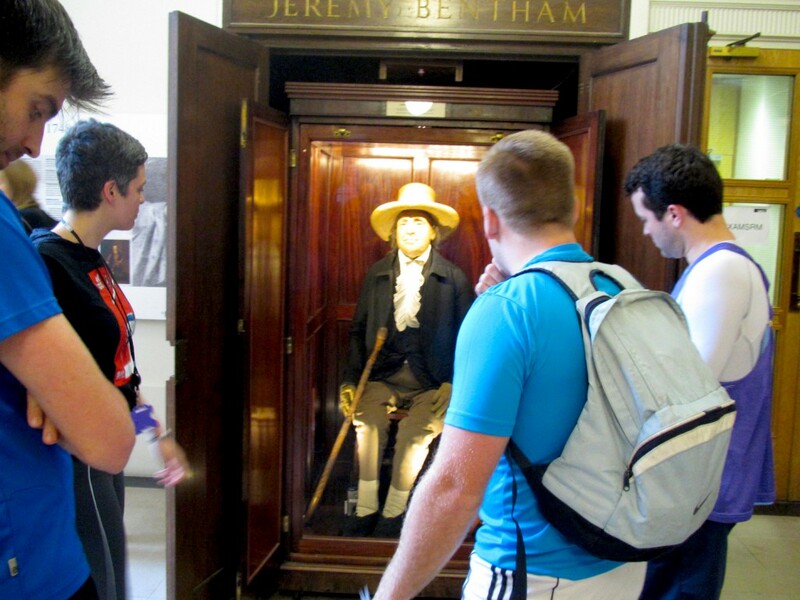 Jeremy Bentham is branded as the spiritual founder of University College London. He was also a philosopher identified with Utilitarianism, which he defines as ‘the greatest happiness of the greatest number that is the measure of right and wrong’. Happiness is the predominance of pleasure over pain. In several respects, Bentham was controversial and ahead of his times. Few people know that, ‘in order to be refreshed’, Bentham would jog at St James’ Park; he called his exercises ‘pre-prandial circumgyrations’. Bentham believed in the importance of a healthy body for a healthy mind. In addition, he thought that treadmills could be used to reform criminals. Bentham’s dictum of the correlation between a healthy body and a healthy mind echoes the Latin phrase ‘mens sana in corpore sano’ which refers to ‘sound mind in a sound body’. The phrase originated from the work of the ancient Roman poet Juvenal. 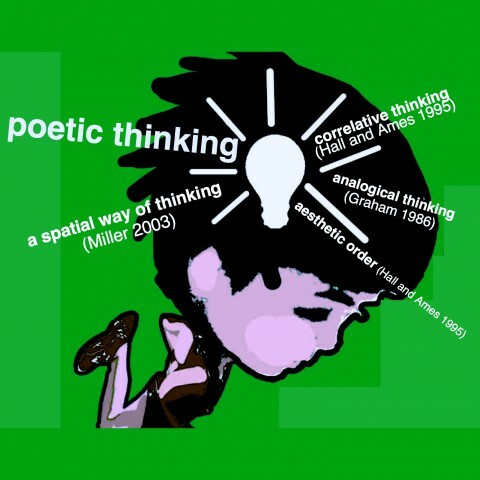 The thinker goes on to declare the marathon a form of ‘demonstrative suicide’, a ‘strange sign of weakness, harbinger of a new fanaticism’ (1989, p.20). These philosophers are lazy and unfit. It is not that everyone must get up and run marathons. They are lazy and unfit because of their unwillingness to even leave their armchairs, to step out to look (rather than from the safe distance of their window or ivory towers), to see what the fuss is about, why so many people all over the world have taken up running since the 1970’s, and to be inspired by that energy in some way. These thinkers are also lazy and unfit because of the stiffness in their thinking, to be perhaps trapped by the heritage that draws a line between the body and mind, and delegates the body as something less important than the mind, or a mythical soul. That may be the real myth. With The Jeremy Bentham Versus Lazy Philosophers App, the contemporary runner can channel the spirit of Jeremy Bentham, and shatter this myth into smithereens. 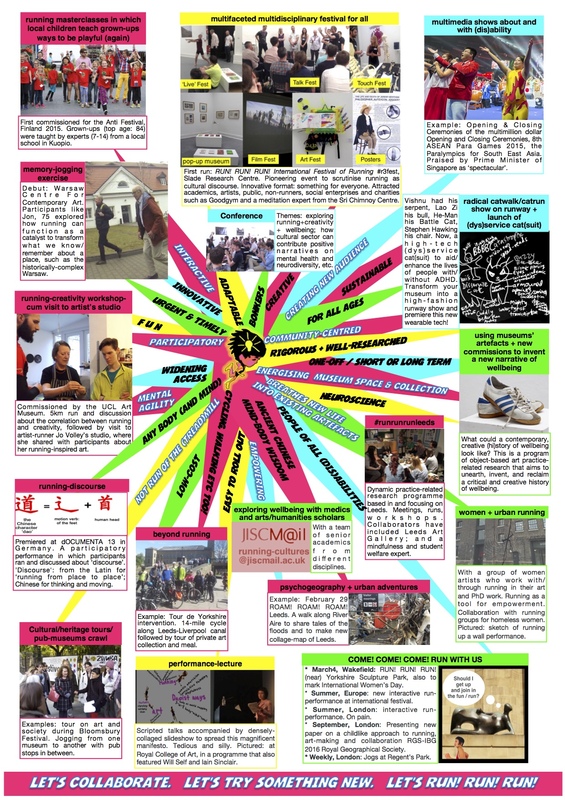 This project can be a self-contained project, or part of a larger research exploration which you can read about here. Above: Jeremy Bentham as poster boy of the app. Below: Colleagues from the brilliant Bentham Project and the Public And Cultural Engagement teams admiring Bentham’s Auto-Icon.